I’m knitting to a deadline at the moment, something I haven’t done in a few years. It makes for an interesting change of pace. 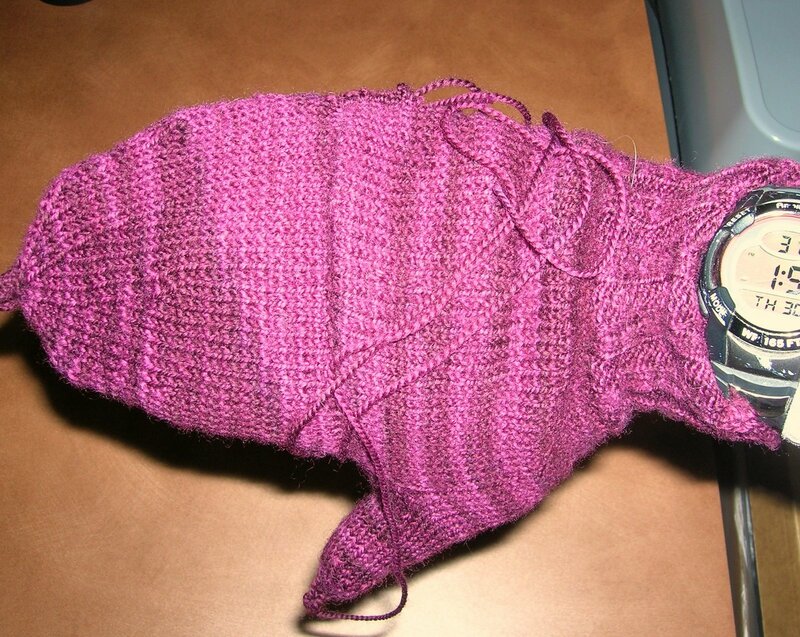 It makes the knitting somehow different, a bit more of a competition against time. I wouldn’t want to do this all the time, but as an occasional thing, I’m kind of enjoying the challenge (check in again next Monday as the deadline comes due to see whether I’m still enjoying the challenge). 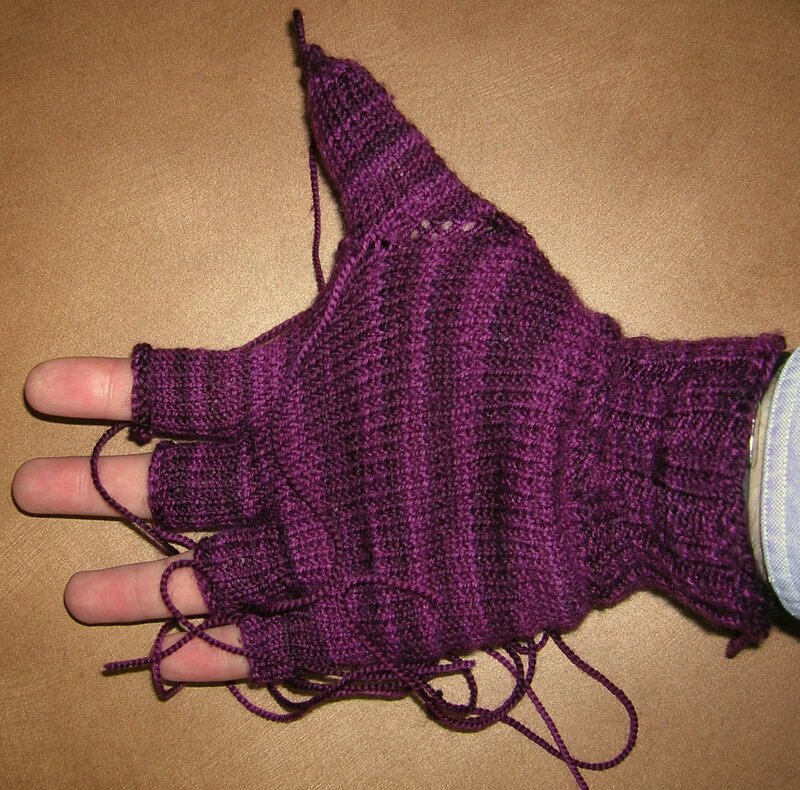 The project is a pair of Broad Street Mittens, which is a pattern I’ve knit several times before (though the only time I blogged about it was apparently here). In this case, I’m knitting them up for my MIL, and hoping to send them with Eva next week. 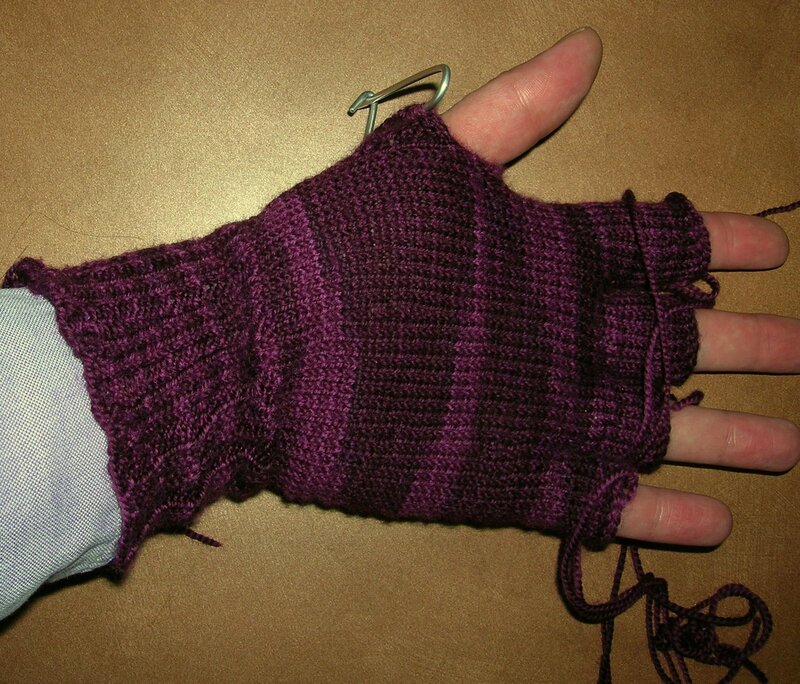 It’s a pattern I like, and have finished a mitten in about a week, so it’s not completely unreasonable. 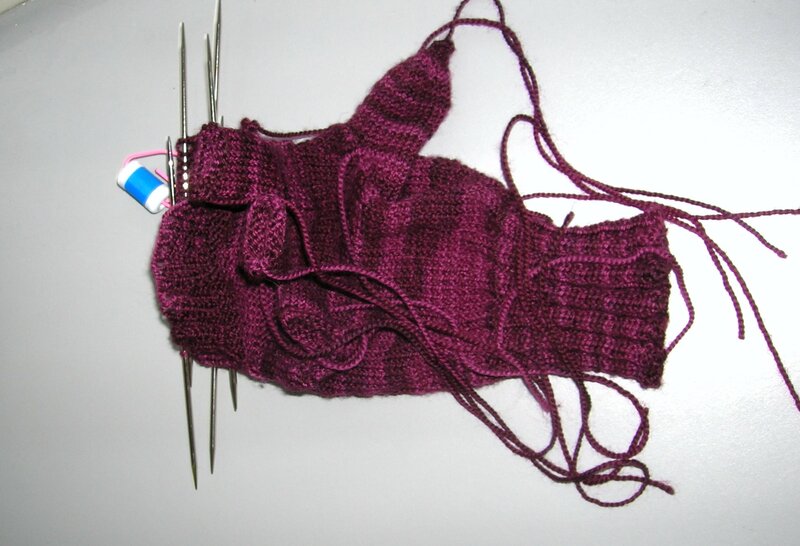 As you can see, the first mitten is not quite done yet. Which is a bit of problem. But I’m gettting there, and I do believe I have a chance at making this work. 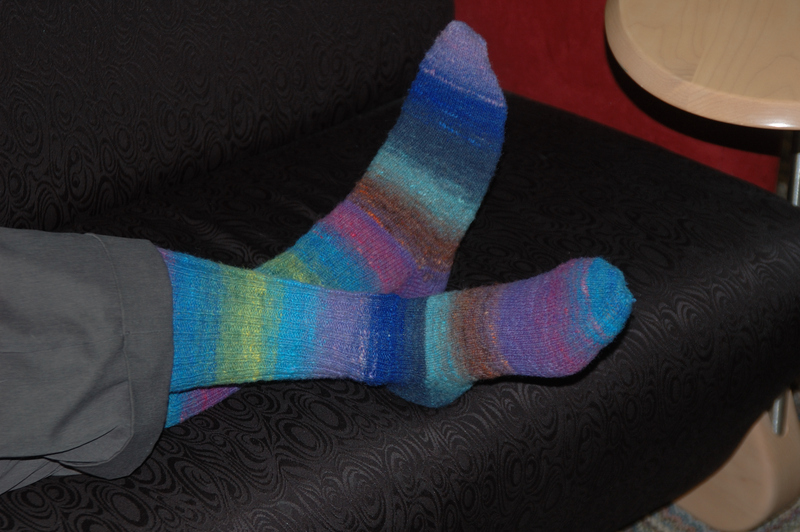 Recently, a lot of my knitting has been fairly long-term. 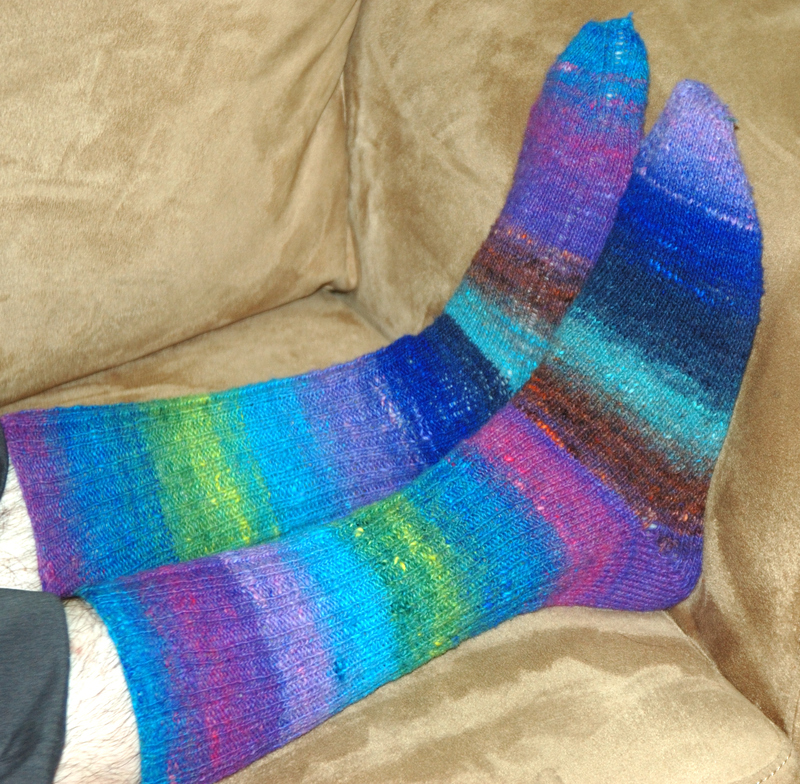 The kind of project (like an afgan) where you will finish at some point, but that point may be months away. This project is a concentrated sprint, which is making for a change…a sense of a push. It’s bringing a challenge to my knitting I haven’t felt in a while. It’s not the challenge of a new technique, nor of stretching my brain, but a challenge of time: can I complete this work in a fixed time. For now, it’s fun, and I’m delighted to be racing against the clock. We’ll check in about that again next week. Every year at Rosh Hashanah, I try to look back over the year which passed, the events which have transpired and how I’ve changed. This year, I thought I might do some of that by looking back over the blog posts I’ve written since last Rosh Hashanah. I’ve written 95 blog posts (this will be the 96th) since last Rosh Hashanah, going back to last October and this post, wherein I was noting how strange it was to move from the workaday world to sitting with a family as a loved one died. It was light postings through December, as I was really getting my feet under me as a congregationally rabbi in Salem. I was learning to balance the roles, while still talking about knitting upon occasion. There are the posts that describe specific events from the year. There’s the post talking about how I invoked the Oregon State Senate, which was amazingly cool. Also when I passed the 100,000 mile mark on the car, and thinking about where the car had taken me. There was the time I saw a pair of raccoons in the yard. There’s the post I wrote as I was leaving Salem. Then there are the feline related posts. We adopted Chloe and were excited. A week later she was dead, and I wrote my prayer for a dead pet. Ten days later, we faced a much harder loss. Diana, who had been with me for 14 years, died. There are posts about the connections between knitting and spirituality. And posts about my experiences teaching Sunday school and bar and bat mitzvah students. And posts simply about Jewish Spirituality and theology. There were a whole slew of posts about Shabbat. Some commenting on how ready for it I was, some on how I planned to spend Shabbat. 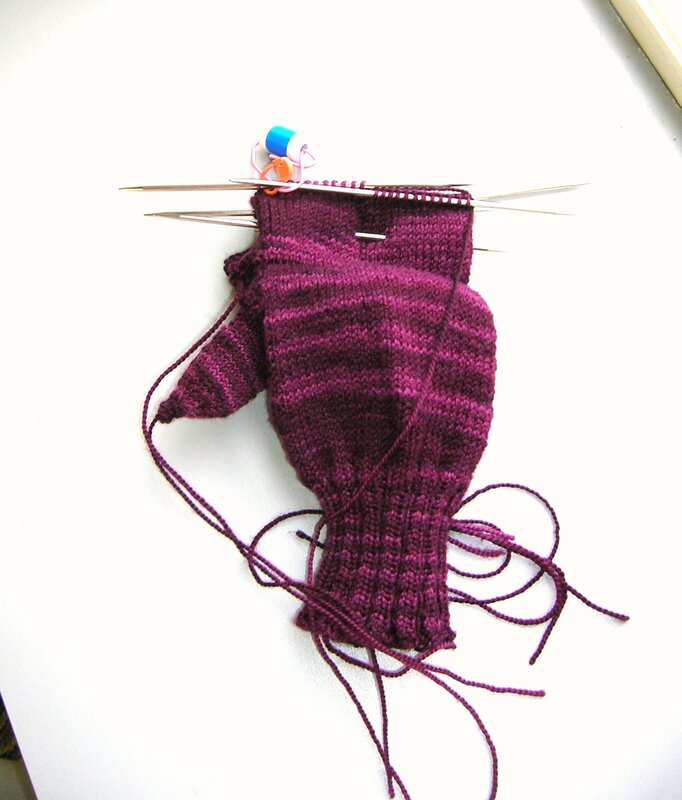 There are a huge number of posts about knitting, and I can track my progress through various projects over the course of the year. I note a few times that I seem to have a lot of projects going at once. My celebration of finishing a shawl that took about 6 months. I note a number of posts talking about how much I’m enjoying what I’m doing, but I’m exhausted because I’m doing too much. And also a post about how cool it is that I get to perform weddings. And several posts about doing funerals, how satisfying it is, and how hard it can be. There are blog posts about me. About me feeling like I’m getting older and that my brain is less efficient. There were some humorous posts (or at least attempts). One about Hannukah. 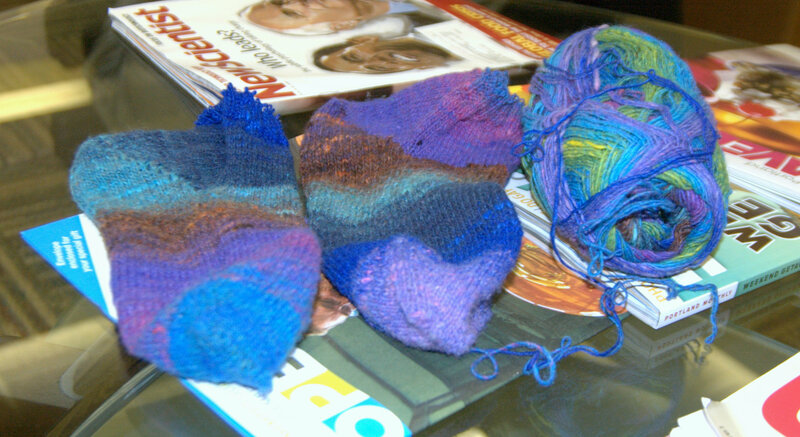 One about Purim and Talmud and Knitting. A post about why I haven’t been posting. A very mildly humorous post about fictional items for auctions. A post about Rosh Hashanah sort of rounded out the year. There were post about flowers and the coming of spring. A post about cleaning up the front yard. And a post when I realized I’m not going to have the garden I’d hoped to have this year. Then I took some pictures of flowers on the way to work. Also some posts that are among the most frequently searched by keywords. One about the fact that life isn’t fair, usually in our favor. Another on the subject of being strangers in the land of Egypt. It’s been a long, full year. I’ve been at CubeSpace and at the congregation in Salem. I’ve performed 8 weddings, and 6 funerals. I done 9 bar or bat mitzvahs. It’s been a long year, and a good year. I’ve grown and become more the person I want to be. I’ve shared much of that with you all who read my blog, and it’s been a privilege and a pleasure. You’ve made insightful comments and sympathetic comments. May the new year be a good year for all of us. Shana Tovah umetuka. A good and sweet year to us all.